new paper, FB Pearl 300, at The Photography Show. Joining PermaJet’s acclaimed Fibre Based range, FB Pearl is a beautiful paper with a 300gsm base suited to exhibitions, distinction panels, commercial use and high-quality fine art prints. Its sumptuous pearl surface, reminiscent of silver halide glazed fibre-based materials, gives every print an extra special look and feel. The advanced coating technology allows for excellent tonal range and pin-sharp detail making FB Pearl the perfect choice for portraits, landscapes and more. Delivering high contrast and rich blacks, PermaJet’s new paper is exceptional for colour and monochrome images alike; its natural white base allows for accurate colour renditions and stunning monochrome tones. Launched at The Photography Show in Birmingham, FB Pearl 300 follows on from the great success of Photo Lustre 310 which has received 3 industry awards since its introduction last year. 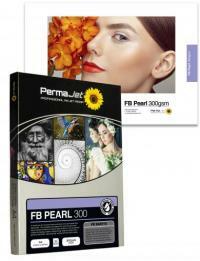 FB Pearl 300 is available in A4 to A2 sheet sizes and 17” to 44” rolls. It will act as an immediate replacement for PermaJet’s FB Satin 310 which has now been discontinued, offering users an exceptional alternative. or speak to the sales team on 01789 739200.